Aluminum Medical Alert Necklace with chain. Small Medical Alert Symbol engraved on front side easily identifies this as a medical alert identification tag to Emergency Medical Personnel. Anodized Aluminum with Silver Engraving. Custom engraved with up to 7 lines (up to 23 characters max per line) of your important medical information and contact telephone numbers. Tag Size is 1-1/8" wide x almost 2" tall. Lightweight Aluminum is easy to wear for extended periods of time. 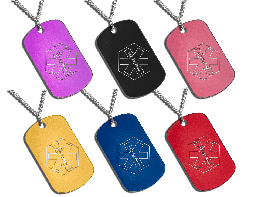 This tag is available in your choice of colors: Red, Blue, Purple, Black, Gold, or Mauve. Each tag comes with your choice necklace chain. Shown with our Beaded neck chain in pictures on this page. Other chain options are 27" endless necklace chain in 2 different weight/link sizes.